SOUTH Africa’s mines minister, Gwede Mantashe, said a decision by the Minerals Council South Africa to seek a judicial review on the Mining Charter was a pretext for cutting jobs. 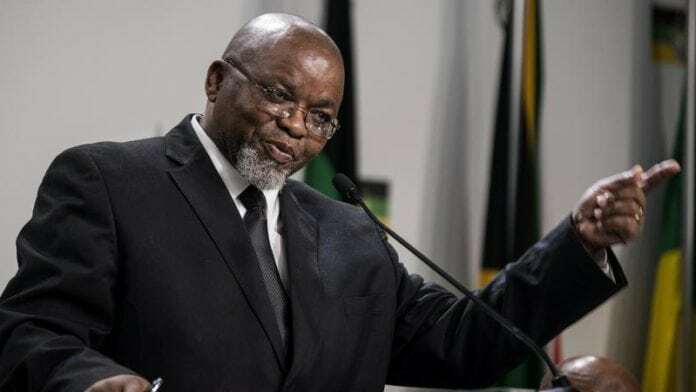 Speaking on the side lines of a pre-election meeting he was attending in Vereeniging, south of Johannesburg, Mantashe said the Minerals Council was only interested in creating uncertainty in the mining sector because it was in this context that it could continue to cut jobs. “The council came to see me two weeks ago and said that it wanted everything to go its way,” he said of a meeting in Cape Town regarding the Mining Charter. Mantashe said he told the council that the charter was a document involving the input of “many stakeholders” and to “have everything you like is selfish”. He said the council was guilty of bullying. The Minerals Council announced on March 27 that although it hadn’t exhausted negotiations with the Department of Mineral Resources (DMR) on additional changes to the Mining Charter, which was updated by government gazette in December, it would ask for a judicial review on the issue of ‘continuing consequences’. This is the term is uses to describe the issue of whether mining companies are always empowered once they have met the original Mining Charter criteria of 26% (and other targets) as set down in 2004. The most recent wording of the Mining Charter makes it explicit that in order to renew a mining licence, or transfer it, the mining companies must re-empower themselves in line with the 2004 targets. The council argues this is contrary to a High Court ruling in 2017 which stated that mining firms, having already met empowerment criteria, were not required to do it all again. The mining sector has been negotiating this point with the DMR since last year whilst simultaneously acknowledging that the Mining Charter, as per Mantashe’s 2018 iteration was a vast improvement on a previous version. Mantashe said his charter had brought about stability: “I can assure you that the charter has given us stability. “At a mining indaba in Canada (Prospectors & Developers Association of Canada conference) every delegate said they saw South Africa in a positive light. But the council is not used to stability. “It is creating uncertainty themselves because it wants to destabilise the industry so it can have excuses to actually cut back on jobs. But we will engage with it,” he said. Mantashe also acknowledged that if the judicial review went the way of the council, the DMR would have no option but to comply. “It wants to kick away investments because it wants a new uncertainty. If it is in court, it and it wins in court, we will comply,” he said. So now we need excuses in order to cut jobs??? We run businesses and, unlike your governing party, we do not have the luxury of virtually unlimited amounts of other people’s money to waste and steal… If the business is not making money or, indeed losing money, it is our job and responsibility to shareholders to close down unprofitable operations or shafts. I will not authorize one cent of investment in South Africa, we will harvest what we can, invest in replacement production capacity outside of South Africa and get the hell out while the lights are still (sometimes) on…. Gwede you are dumber than I thought! Why on earth would the council want to create uncertainty? They are desperate to clear the uncertainty you fools have created! Open your eyes and ears and see what little investment is coming in and WHY! If you want jobs created and protected do your bit as a stakeholder and formulate attractive environment! Its effectely still same Dmr was than the Zwane one. Same officials, same bad policies, same bad systems. Why should we trust them. Let the courts give us clarity. I’m glad the Mantashe honeymoon is over. Better to deal with the true character, now that the anyone but Zwane love affair is over. Minister Mantashe is a red-sock communist. He is ideologically incapable of developing even a half investor friendly mining policy. SA mining policy is bad for investment, the administration of that policy is incompetent and corrupt. Together this makes SA mining all but uninvestable. Both Anglo American and Sibanye have called a spade a spade – neither will invest any new business capital in SA. All capex is now stay in business capital only. Any mining industry which has no new projects is by definition in decline. Sunrise industry my foot. The only thing that will drive the ideological change needed is a Minister with an explicit growth mandate for the industry and permission to revise the policy and administration accordingly. My gollies, what blatant lies will still come out of the mouths of these rulers of the state. This specific one sounds like a drun….. most of the times in any case. How can the council destabilise the industry that have being destroyed by these lot. Now throwing job cuts against them, but not acknowleging why job cuts had to come in any case. They sitting on their high chairs always too busy with lots of nothing while industry is attacked from all sides, particularly stupid union deathwish actions and the state falling backwards in assisting to get it resolved everytime. It’s amusing to see a Minister employing phrases and tactics out of the Stalin era. Even the Russians have moved on. Come on Comrades, look at the enormous success of Norilsk. They’ve discarded the outdated rule book and are making money responsibly for everybody – including the workers..